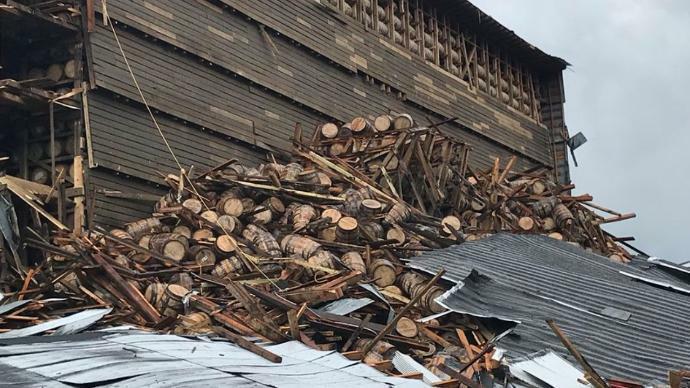 A bourbon distillery in Bardstown, Kentucky saw 9,000 barrels of still-aging drink come crashing down when a building collapsed Friday morning, according to CBS Lexington affiliate WKYT..
Officials said no one was harmed at Barton 1792 when the rickhouse, a storage structure for aging bourbon, suffered partial structural failure. The matter could have been worse, as the building housed roughly 20,000 barrels total. An EPA team is investigating potential spillage of the bourbon into a nearby creek. The structure reportedly dates back to the 1940s, and concerns of its stability have set teams to make repairs to prevent further collapse. The distillery told WKYT it will close its visitor center and not offer tours for the rest of Friday. It plans to reopen Saturday morning. Bardstown has been called the "bourbon capital of the world." It's located about 40 miles from Louisville, Kentucky. The good die young... RT @WKYT: This aerial photo from Louisville CBS affiliate WLKY provides a better look at the collapse at a Barton 1792 facility in Bardstown.